Explore a dimension out of synch with the known planes in this expansive treatment by Bruce Cordell. Learn about cenebrotic blots, where the Far Realm touches the Material Plane, and steep your characters in the lore of cenebrosis, the ability to manipulate weird Far Realm energies. A host of new spells and creatures rounds out a spectacular article that is absolutely not to be missed. 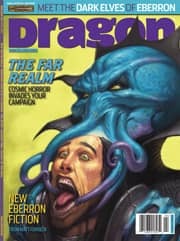 Shapers of Shadow: Eberron's Umbragen by Keith Baker - Learn about the mysterious shadow elves of Eberron from Keith Baker, the setting's creator! This reclusive drow sect dwells on the thrilling continent of Xen'drik, manipulating affairs with a special bond to a shadowy realm known as the Umbra. A new prestige class and a variety of feats give you everything you need to insert the Umbragen into your Eberron campaign. Four heroes of Eberron enter the Mournland to carve out a new home. A prelude to Marked for Death, the first novel in the upcoming Lost Mark Trilogy.